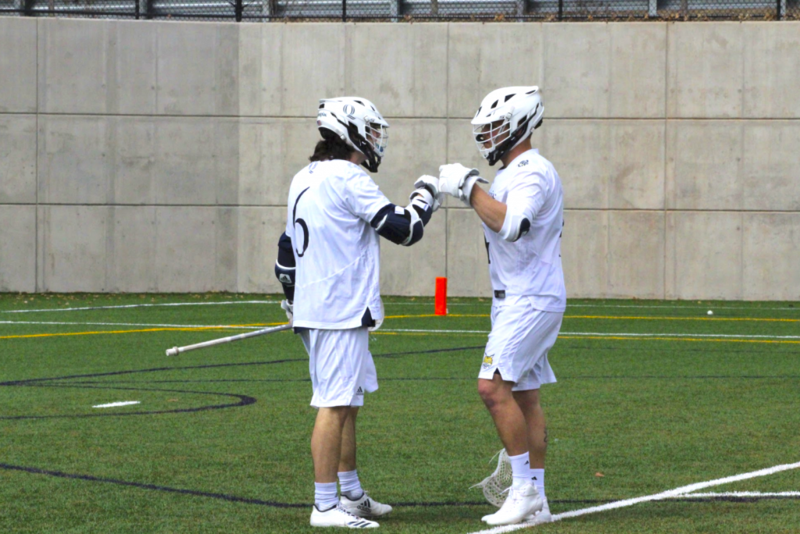 Quinnipiac men’s lacrosse (6-5 overall, 3-0 Metro Atlantic Athletic Conference) built off a seven-goal first quarter to defeat the Manhattan Jaspers (3-7 overall, 0-3 MAAC) by a score of 9-5 Saturday afternoon. Junior attack Mike Fletcher led the way for the Bobcats with a hat trick and three assists as well. The Bobcats built an early lead and never looked back. In the first quarter alone, Quinnipiac fired 19 shot attempts on Manhattan senior goalie Michael Zingaro, scoring a total of seven times. Zingaro was not able to register a single save through the first 15 minutes, as Fletcher scored all three of his goals in the quarter to help the offense of Quinnipiac to a tune of seven goals, while only giving up two. After the offensive showcase in the first quarter, it was a defensive battle the rest of the way through. Manhattan outscored the Bobcats in the final 45 minutes by a score of 4-2, but could not climb out of the hole they had dug in the first quarter. Quinnipiac, on the other hand, seemed to take a step back, as the offense was quieted for the remaining three quarters. But they relied on their dominant first quarter and were able to hold on to win this game 9-5, with junior attack Foster Cuomo tacking on the other two goals to bring his total to a team-leading 22. The defense was outstanding for the Bobcats. Sophomore goaltender Joe Zukauskas finished the game with 11 saves and limited the Jaspers to only five goals. This was certainly a positive, as the Bobcats had given up double-digit goals in their last four games. The Bobcats will need their defense to continue to lock down the opposition as it will head into their next matchup against Canisius, the only other team in the MAAC to be undefeated coming into today. Quinnipiac and the Golden Griffins of Canisius will square off Saturday, April 14 at 3 p.m. in Hamden for the Bobcats final home game of the season.